The Spa Side Handrail™ is the most user friendly spa side assist product on the market. This device provides 180 degrees of movement to allow for easy spa entry and exit. An added locking feature enables the handrail to be fixed in any position for increased safety and peace of mind. 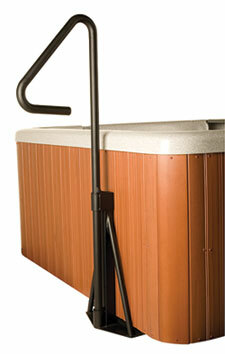 The reduced thickness of the handrail grip offers superior comfort to any spa user. The Spa Side Handrail slides under the spa cabinet for complete installation and requires no hardware or assembly. - Durable zinc plated and powder coated finish. - Swivels to provide ease of entry and exit.